Thinking about the perfect house that we can call ‘home’ and that emit that kind of comfort that a ‘home’ should, always brings a different kind of view in mind, and makes our minds wander in a different direction. While to some of us, it might mean villas and penthouses, to most it gets painted in form of a small beautiful building, having a garden, some plants, maybe a small patio, and an awning. The kids playing around with the miniature basketball court accessories, and the couple sipping their hot beverages while calling out the kids to be safe, is almost everyone’s core fantasy. 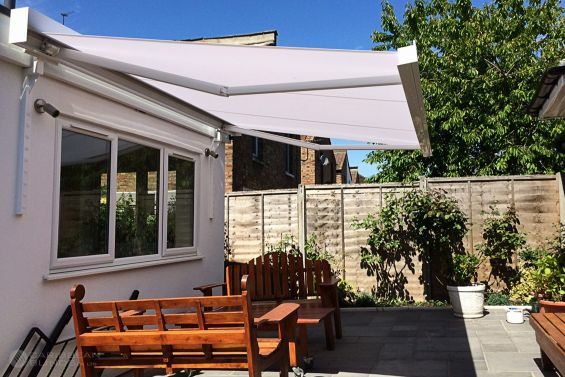 If we think about it, adding a patio to our beloved dreamhouse might cost a fortune, depending upon the area that we live in, but if we are ready to compromise a bit, a garden awning can add the desired tinge of perfection to our wishes. Use the space below the awning as a place to keep sofa set and let your guests be mesmerised by the beauty of it. Spread out on the terrace, and use it as your personal picnic spot. Some lights here and there, to bring festivity to your place all year around. Add some bells, DIYs, to bring your entire place to life. Don’t forget to fill in colors while doing this. Put a recliner or two and add some speakers to keep the party going. Some folding chairs won’t use up much space but add to the sitting space. Use the space for keeping the bikes, folding chairs, etc. While all the aforementioned points might seem really simple to-dos, they are meant to definitely add liveliness to your home and to always keep the spirits high in some or other ways. These small things might actually transform your life and the way you have been looking at life till date. While the garden awnings used to be available only in stripes and checks patterns a few years ago, there are many options available now (more than you can actually imagine), and if you do not like any of them, just get a solid colored (or mildly checkered) cloth and paint it as per your own imagination and expectations, throw in some DIYs, some decoratives, maybe some lights, etc. and you have the subtle excellence ready and waiting for you and your family. With all that in place, the most important thing is the prevalent laughter and peace at your place. The decoratives, festivities bring with them, a level of positivity and should be taken a bit more seriously than they already are. With positivity, we attract growth, smiles, and success. So, you see the tad bit conscious effort in decorating your home for good can do you more good that it looks like. Now, don’t just ponder upon it. Go, redecorate and be positive!